An Ohio witness at Cleveland reported a close encounter with a triangle-shaped UFO, according to testimony in Case 75119 from the Mutual UFO Network (MUFON) witness reporting database. The event occurred beginning about 10:21 p.m. on March 8, 2016, with the object heading south, and the witness soon dictated details into a telephone as he is a lifelong visual artist. The witness first thought the object was something that could be identified. The witness described the lighting on the objects. The craft was traveling very slow and low to the ground. There was an aspect of this triangular pattern that was hard for the witness to comprehend. 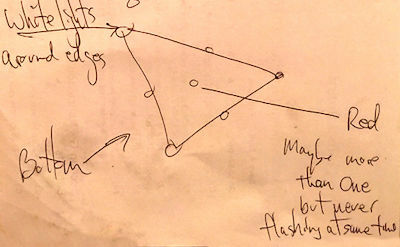 As the object moved overhead, the witness thought there was structure to the object. The craft has an internal ion generation propulsion system. It is basically like an ion breeze fan with no moving parts but the ions "blow" in and are contained internally and condense. By changing the polarity of the containment walls the craft can increase speed and change direction in any aspect. The condensed ions will attempt to repel from the charged wall and "push" the craft in the direction it needs to go. The faster you need to go the more surface area of the walls is charged. Since you have five walls of a triangle you can go in all those directions just by charging the proper walls to create repulsion propulsion. The glowing corners are just a necessary fact to release the static energy built up inside the containment vessels created in the process. These craft are actually all electric and only use small highly efficient frozen methane gas generators to create the electricity to power the ion generators. Frozen methane gas is the most abundant power source on the planet. It is easily safely stored and transported. A 2 foot square cube of frozen methane can provide enough fuel to power the craft for a week. Once the ions are sufficiently condensed very little power is actually needed to operate the craft which is manned by 3 people who sit inside a enclosed area in the center of the craft. One individual is the pilot the other is the sensor operator and the 3rd is the mechanical systems engineer. They are all contractors and the craft are capable of landing without a runway and no major ground support. They use closed federal wilderness areas to land when necessary. The craft is virtually constructed entirely out of fiber carbon composite panels and weighs not much more than a family van or small cargo truck. There are a number of diagrams on the web of what witnesses describe as what the undercarriage of these craft look like. Those are the ion generators that are seen. There are multiple triangle compartments as seen by each depressed area.